Uh, hi, Newcrest. I’m Maeko and my older brother is an idiot. He basically threw away the chance to be the next heir and take over caring for the town and all that. Rather than take up the reins and become a body builder he decided to become a musician and run off with his girlfriend, Bailee. Mom was FURIOUS with him. She told me that once she found out they had been sleeping together she knew he was done for. All interest in continuing our family legacy GONE. He left home suddenly and didn’t tell us where he was going. Dad says that Roka is just about old enough to make his own decisions so he isn’t going to push anything on him. Dad has always been a real nice guy (Kyoko called him a pushover when we were talking later). Kyoko is my twin but we’re not similar at all. Now, let’s talk about me. I’m into yoga. That’s not quite body building but it’s something. I’m still learning but I think I’ll be able to get things figured out! Everyone tells me that I look almost identical to my Aunt Miyako. The resemblance is really striking. Kyoko looks a lot like mom only her hair is darker. Before Dad turned gray he had the same color hair as Kyo. Our little sister, Eri, is often by herself a lot as the current youngest member of our family (I mean, of our whole family not just our immediate; my mom is done having kids!) Right now Eri has Izabella and Philip but they’ll soon be teenagers and she’ll be alone again. She’ll still have me, at least. Honestly, I get along with her better than Kyo… I left my diary out once (I was really sick and not thinking!) and Kyo was all up in that. Eri came to my rescue! Gosh, I love Maeko ! Me, too! 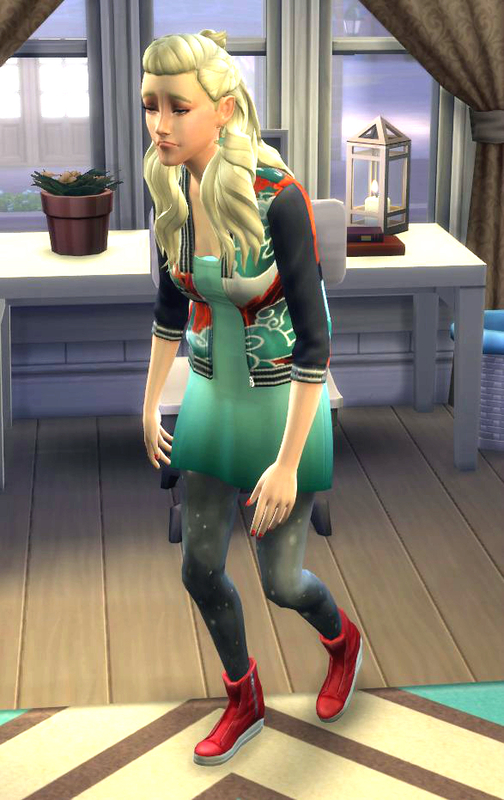 I love the style she aged up into (the dog dress) and actually kept it as one of her outfits! The other one I have for her is equally cute, I think! Her earrings are planets! I guessed you’d chosen that dress for her ! How cute she aged up in it! You already know how much I love her! So exciting. Now I’m going to want to play this some more tomorrow, LOL.